Information that can be helpful in your Greek family research. 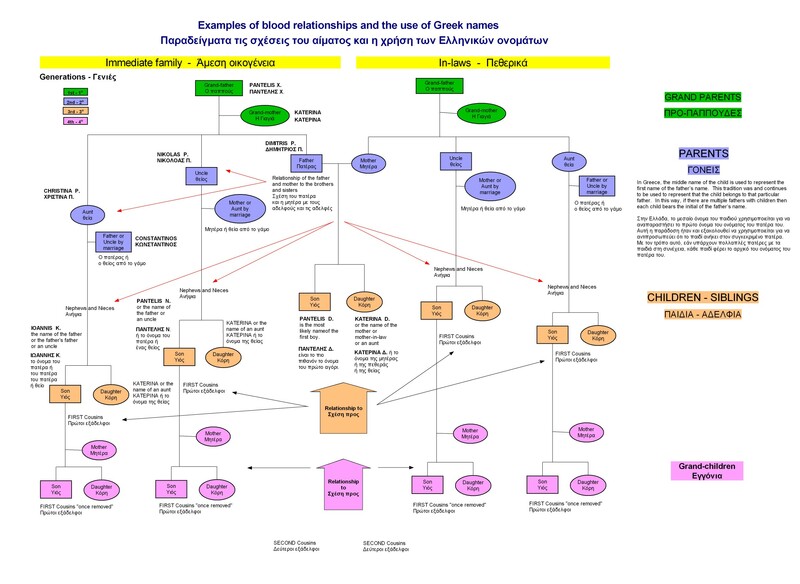 You should request my advice before applying any information as part of your own Greek family tree research. The search could generate negative or no results during your genealogy research for Greek family names if you are attempting to transcribe Greek names and surnames. To see the Greek characters on this page change your browser encoding to UTF-8. This change will not affect your normal browsing if you wish to keep the setting. Simple tips on researching Greek family roots! Church records are available through the Metropolis or Patriarch located in the locality of the research area. They are not availabe online as yet and maybe limited due to wars and other disasters in Greece. Baptism and Birth were combined in the past but are completely separate today. Marriage were issued by the Greek Orthodox Church in the past and may be filed at a municiple office now. Death were and are issued by the municiple office. All of the above records are local to the area of residence in Greece. Mitroo Arenon or the boys registry are lists containing the names of boys who will be drafted into the Greek military when they reach the necessary age. Cemetery records and in some rare cases tomb stones and graves that may be kept by a family member provide some dates of birth and / or death and may include photographs, if the graves are maintained. All of the above records require proof of relationship or a legal request by a court of law. School Records or school lists by year that may contain the names of the parents, the child, age. Refugee records may be available with lists of surnames that can provide a clue to the area from where they were emigrated from. These records may be available by searching through the General Archives of Greece. Greek Corporate and Partnership business registers are another possible source of family relationship that may provide age and year of birth, and vital source information about the shareholders. The Gazette of the Greek government also known as FEK may list the names of individuals and information about the work or job title, as well as company names. All information will be in the Greek language, and require some knowledge of the area and years for researching Greek genealogy. Greek History books may contain references to family members if they were part of a historical event. The Greek telephone directory can help pinpoint where the family surnames were located and were many of them are today. Generally speaking, translating first names from Greek to another language does not have a standard. My name based upon my heritage should be Pantelis but the name Peter is translated similarly from Pantelis, Petros, and Panagiotis. I have also heard it translated from Pericles by another family. The Greek services however gave me the name Petros instead of Pantelis based upon a strict translation which was wrong. Example: my own first name is translated by the Greek authorities from Peter to Petros but in actuality it can also be represented as Pantelis or Panagiotis (Πέτρος, Παναγιώτης, Παντελής), while my last name can be transliterated from Μπουρνιάς to either Mpournias or Mpoyrnias or Bournias. Therefore, when translating from English to Greek the correct situation is to keep the first name because the individual who is not born in Greece which is my case should have been written in Greek as Πήτερ. See more on Foreigner's names below. A nickname is referred to in Greek as a "paratsoukli". It is a name used to refer to a nickname or as a profession based upon a characteristic and can be applied to the first name of a person as well as the family surname. There are many people with first and last names using nicknames in Greece. Kafetzis, the person who served coffee. Papoutsis, a person who makes shoes. The above are generalizations and may have alternate uses. Many Greek names are derived from the original name as a shortened version. An example of this is the name Haralambopoulos for which the name Harris has been used. Here is an short example of common Greek surnames can be indicative of a geographical location in Greece. Due to numerous wars and other disasters in Greece, many surnames may have moved to other areas. The correct translation of a foreigner’s name to the Greek language from another is the phonetic translation, e.g. Peter in Greek should be Πήτερ. Your name should be recorded as it sounds on legal documents unless the family wishes to use a proper Greek name from their own relatives. Depending on the Greek official, they may tell you otherwise but you must insist and demand that it be translated the way that you want. Your signature should also be recorded as used in your own country. You should not be expected to provide it written in the Greek language. The same holds true for Greeks moving to other countries. One of the biggest problems when searching for someone with a foreign name is that they may have changed it to a completely different name or even surname. Whether your name is one of family tradition to respect a family ancestry or simply a name chosen by your parents for other reasons, the country where you are born or reside will usually affect the way your name is recorded. As an example, the name in Greek Μιχαίλ can be recorded in latin characters as Michael in the United States, Canada, England, Australia and elsewhere but it may also be recorded as Michail which is used in Russia. The Greek services have registries of Greek families and are not centralized. The information available is provided by the local authority based on the area of the individual. Each of the Greek registries of family records in Greece may have information regarding Greek families but may be limited due to the wars between Turkey, Germany, Italy, Bulgaria from various periods. Family Status (may provide information regarding children of family members). The Greek Orthodox Churches began to create registries of baptism and marriage. This began roughly around 1825 and continued up to about 1915. There were many reasons for this, some of which included preventing polygamy, to prevent marriages between close relatives, and the creation of organized family records. Although the Greek government began the manual record keeping around 1915 for the registries of birth, marriage, and death, the church continued to keep records. The church was also affected by the depredations of wars and due to the destruction or loss of local church records. It began centralizing the local church records at the Metropolis for each area. The Greek Orthodox Church is currently creating a digital archive of the records that it has but it has not provided access through the Internet as yet. Information regarding the records of birth, baptism, and marriage are sometimes provided by the church for those of the Greek Orthodox religion. The Greek Orthodox Church, local to the area, the Metropolis, or the Patriarch. The Metropolis or Mitropolis was used to archive records from the local churches as a backup copy. Anglicized given or first names of Greeks from ancient Greek, the Byzantine Empire, the old and New Testament. A list of locations or places in Greece directly transcribed from Greek to Latin. The Foundation of the Hellenic World will allow you to volunteer your Greek family genealogy but they will only provide access to those records by the immediate family members. 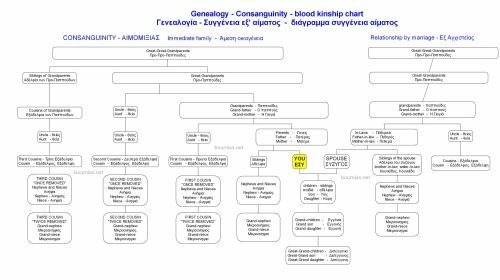 Is there any digital information available for Greek genealogy that can be accessed via the Internet? Yes, but it is limited but it is improving year by year. The General Archives of Greece or GAK is a well known archive of historical information for Greek genealogists. Users should be polite, considerate, know Greek very well, and know specifics regarding the genealogy search of the Greek archives. The database on their website includes scanned images from government records that include court property, company, and other records but as they are stored as images, very good knowledge of older versions of Greek are required to be able to read them. The government agency that began recording information is known as the Digital Collection of the State Archives or GSA in Greece. The following link is from an exhibition of the General Archives of Greece. A view of what kind of documents the GAK has to offer. A link to one of my blog articles regarding the GAK. The libraries in Greece also have original documents of books, newspapers & journals, archives, manuscripts, art, and maps. The Library of the Association of Smyrneans contains published books in Smyrni or Smyrna of Anatolia before and after 1922. The Hellenic Parliament of Greece has a library that allows the viewing of microfiche archives where you can find detailed information for use in your quest of Greek genealogy and ancestry from Greece. Information about the location and hours of the Library of the Hellenic Parliament of Greece. A microfiche catalog is available for download in pdf format that includes names in English and Greek category sorted by alphabet, year, and place. Greek Wiktionary provides a list of Greek names in Greek. As new information is being digitized, I will update this page with more links. Military Recruting draft lists may be available. Military records are not easily attainable and therefore not available online. For those of you who are interested in the royal family, the ministry of the interior has the archives. You can find them through their website regarding diplomatic and historical archives. Land registries are a good source of information for Greek genealogy. The Land Registry (Υποθηκοφυλακεία) has records of property transactions and contain the names of the individuals that are involved in the deeds of the transactions of buying and selling property. Greek Land Deeds sometime include Wills and may have written declarations that can include information from adoption, inheritances, and dowries can be found. There are land registry offices that are usually located in every municipality. To obtain copies of records from them requires either a lawyer (Δικηγόρος) or a notary public (συμβολαιογράφος). Land registries records are not digitized or computerized and copies of the documents are charged based upon the appointed clerk of the registry office. The records are generally indexed by surname. A number of people have asked about Greek census records for Greek genealogy and what is available from them. The Census generally identifies any cataloging by type or by class, e.g. Census of population, military equipment, disasters, goods, real estate, etc. Property inventory, which is the subject of law, distinct in extrajudicial and judicial census, and deals with seizures, inheritances, etc. Catastrophe inventory, social welfare, regarding earthquakes, floods, fires, hail, frost, etc. Greek census data may or may not be available depending upon the year and the locations. The content of these links are in the Greek language because the information may change if one chooses the English language. I have received requests regarding prison records from the past and I have found that the following is what some of you doing research in Greek genealogy should know. The first regards records of the prison and the second is for records of the court trial. Based upon the year, it is most likely that there will not be any prison records because during the 1900's, the first fifty years Greece was involved in wars and that the Germans destroyed the majority of records of that time period. From another case that I had, I could not find any prison records. It may depend upon the location and time period if any exist, they may be at the General Archives of the area of the prison. If a specific location and time period is provided, it may help to see if the court has any records. Regarding court records, the criminal archives from 1964 and back have been destroyed by the government.